This is the third in a series of blogs by the CSU Student Success Network to share information about efforts to eliminate equity gaps in the CSU. CSU campuses are using a wide range of strategies to eliminate opportunity and outcomes gaps for underserved students. The efforts include using data to identify barriers for students, redesigning first-year experiences, understanding challenges in student success initiatives, developing wrap-around services for first-generation students, engaging with faculty about pedagogical practices, and improving the campus climate for students—to name just a few that were workshopped at the Middle Leadership Academy in December 2018 at Cal Poly Pomona. The Academy is a structured, year-long professional learning program that brings together teams from CSU campuses to develop and advance their equity-based work. Data inquiry and sharing. All of the 12 campuses are working on gathering and examining student data to understand the barriers facing underrepresented student groups and to identify high-impact practices to support their learning, progression, and completion. Student experiences. Many of the campuses are working to identify student needs—throughout their time on campus—and provide targeted, holistic services to support them more effectively. Campus climate. Many campuses have experienced changes in the demographics of their student populations and some are developing efforts to engage with faculty and staff about equity-minded practices and approaches to serve diverse student groups, including in the classroom and in advising. 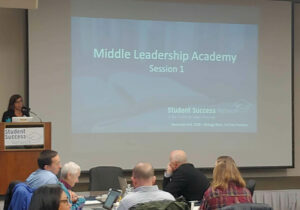 The Academy focuses on supporting “middle leaders”—faculty, staff, and administrators—because of their positions of influence on campus and their connections with students. Middle leaders tend to remain at their institutions for years. Many have direct experience in negotiating education reforms and have extensive relationships and networks on campus. As a result, mobilizing middle leaders can be instrumental in developing and implementing changes that affect student success. Given these levels of knowledge and experience, the Academy’s pedagogical approach focuses on providing a space for campus teams to engage with and learn from each other, rather than bringing additional expertise into the room, though discussions with experts are integrated when helpful. For this academic year, campus teams meet three times at Cal Poly Pomona. Between these three-day sessions, the teams work at their own campus to implement their plans, including engaging with a broader team of staff and faculty back on campus. As one campus administrator said, “We’ll reconvene when we return to campus, to engage our home team and consider the implications of this work. We want to be prepared for dissenting voices. We want to be able to answer those and move forward.” With two more sessions to go in the current Academy class, participants will have many more opportunities to share challenges and successes they faced on campus, and work with each other to strategize next steps. The Middle Leadership Academy is led by Dr. Bianca Mothé, a professor at CSU San Marcos. The two remaining sessions for 2018-19 will be held in March and May. Applications to participate in the 2019-20 Academy are due April 1, 2019. To receive information about the Academy or other activities by the CSU Student Success Network, please email studentsuccessnetwork@edinsightscenter.org. The Network is facilitated by EdInsights at Sacramento State.